They thought they were following the orders of their boss, the mysterious and all-knowing voice on the phone that was Charles Townsend. Those orders placed them in the middle of an international conspiracy that could spell disaster for the civilized world. While it might not be the kind of mission you’d normally assign to a trio of L.A. based private investigators, it’s exactly the kind of thing you’d expect to see on a prime time TV show in the 70’s… in maybe their second or third season, when all of the more believable storylines have been used up. 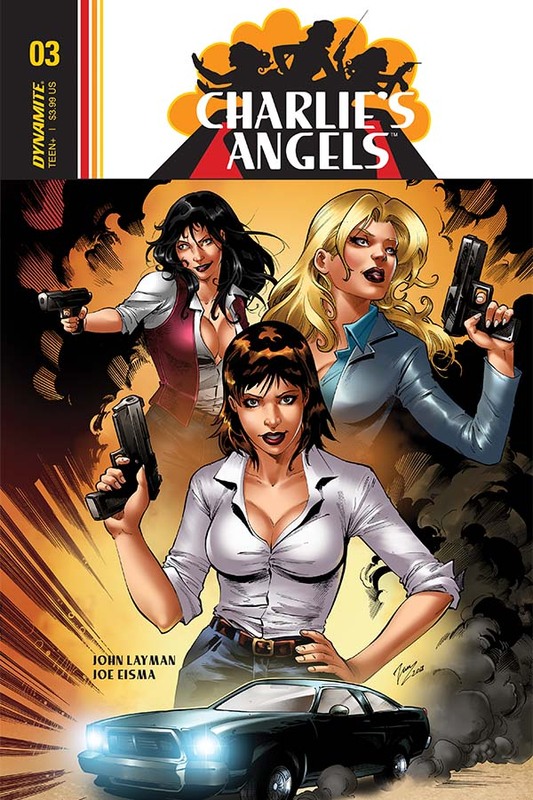 Updated movie reboots aside, it’s back to their cheesy TV roots for the original Angels: Sabrina, Kelly, & Jill. They’re taking the place of an out of commission CIA agent (mistakenly beaten to a pulp by Kelly), to retrieve highly sensitive intelligence from the wrong side of the Berlin Wall. Along the way they’ll make some quips, kick some East German kiesters, and never will a hair find itself out of place on their bouncy, full-bodied, Aqua-Net laden heads. Under normal circumstances, I’d tell you to stay as far away from poorly scripted fair like this, unless you were looking to indulge in a bit of nostalgic fun. 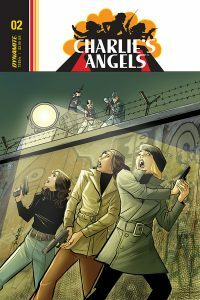 However, the circumstances are not normal, and the folks at Dynamite Entertainment have fully embraced the corny reality of Charlie’s Angels. First of all, I have to give some pretty mad props to writer John Layman. He’s fully aware of how awful his source material was, and he isn’t trying to justify or legitimize it. Instead, he’s just having fun with it. Firmly in place are the ultra-convenient solutions to unlikely problems the Angels face, but added to the mix is some sharp writing that gives a wink and a nod to let the reader in on the joke. Layman is doing a bit of a tightrope act, balancing his script on a premise that could very easily tip out of the realm of “tongue-in-cheek” and into the pit of despair that is outright campy schlock. Laying down the visuals for this nostalgic mission of mayhem is the team of Joe Eisma, Celeste Woods, & Taylor Esposito. Nowhere to be found is the gritty, more realistic look evident in Dynamite’s James Bond titles, and Eisma is given free rein to indulge in a fair bit of whimsy. His Angels are every bit as beautiful and glamorous as you’d expect, but they also carry themselves with a little more attitude… particularly when faced with any bad guys expecting the trio to be easy marks. Doing her part for the cause, Woods’s colors leave the book’s overall look just cartoonish enough to remind the reader of how serious we’re not supposed to be taking things. Rounding it all out, Esposito is upholding his standard as a comicbook letterer, presenting the book’s text to emphasize what’s being said without taking away from or getting in the way of the artwork. That’s a very fine line to have to walk, and it’s one that should earn Esposito some recognition as an unsung hero among comic creators. There really isn’t much of a mystery connected to how this story works… What makes it all work so well is the fact that the entire creative team is one hundred percent in on it. Like a team of adrenaline addicted oceanographers during Shark Week (which was pretty awesome this year, wasn’t it? ), they’ve waded out into the deeper waters of the ridiculous with abandon.